This weekend’s highly anticipated Bollywood offering Dear Zindagi won’t let you down. It is a moving film told solidly albeit with a simplicity that is hard to find nowadays. One wonders why we don’t see movies like Rock On 2, Zindagi Na Milegi Dobara, Wake Up Sid and this appealing presentation that runs no more than 2 hour 10 minutes more often? No the movie isn’t about the ‘Badshaah’ Shah Rukh Khan or his romantic charms that mushily move a girl half his age to fall in love with him. The movie is clearly not about Alia Bhatt’s pretty and sassy character; a diehard lover of a guy much older than her. 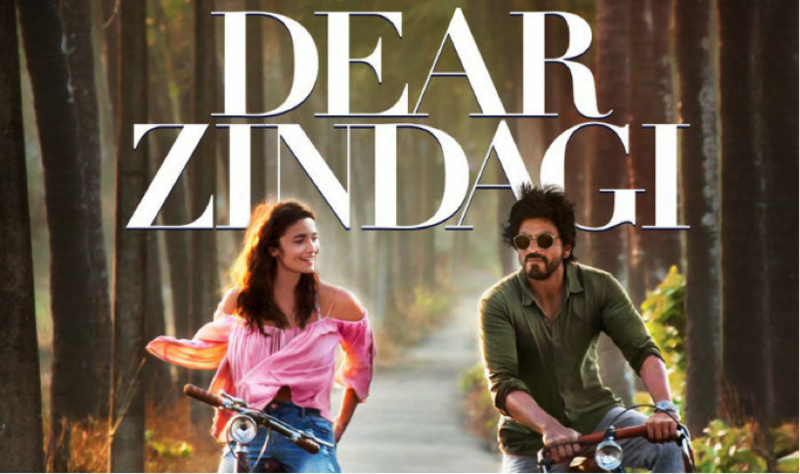 Nor is Dear Zindagi even the minutest of attempts to break stereotypes hindering young girl falls in love with elder man theme, much to the society’s displeasure. In fact, the film is a simplistic, subtle and thought provoking attempt to understand today’s youth. Today India is not just about dominating world headlines for its economic prowess and spirited entrepreneurship. India is a youth-nation with easily over half its population being under 35. But being the youth of a country that is primed for greatness brings larger focus to a less visited phenomenon. That of the youth’s state of mind. Beautiful, sassy, confident, in fact supremely self-confident and sporting a go-getter attitude! Isn’t this the common perception most of us have of today’s youngsters in an India where the scope to realize ones dreams is greater than before? Today, you could dance, sing, create, paint and develop an app for all you care to realize your potential. And increasingly, our youngsters in their drive to achieve their goals leave no stone unturned. This is where they can lose track. We often forget that behind the smiling faces, peppy attitude and burning desire to achieve, lies a canvass of half painted feelings- sorrow, loss of love, fear of committing, cheated in love and whatnot. The opportunities that present themselves to India’s youngsters find tough competition from hidden or unexpressed inner feelings that often threaten to ‘eat up’ India’s youth. Alia in the film comes from that space. 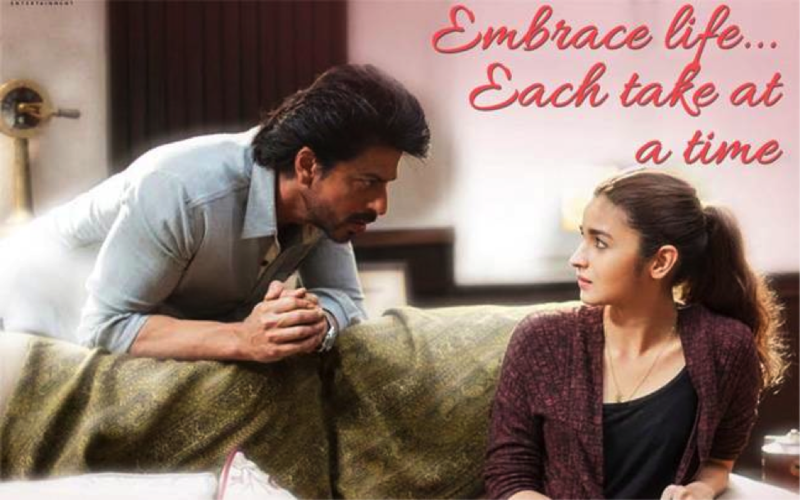 And Shah Rukh in his silently charming avatar tends to Alia’s woes as a cheerful, optimistic consultant. He seems to know the way out of troubles, having faced a bit himself. And Alia, despite armed with great confidence and a bright career ahead of her can’t walk straight on the path to love. At the outset, she’s happy and successful and even more promising in the making. Inside, she suffers. She’s confused and funnily wacky. She smiles but often hides behind pain that isn’t expressed. We leave it to you to find out why? And how Shah Rukh eases the hurting nerves, for a change minus his penchant for being the hopeless romantic, minus being the prince of romance, the king of suave is pleasant to watch. We won’t call Shah Rukh’s bright character a ‘psychiatrist’ as that brings the bias of a doctor who consults ‘patients’. He is a good talker, a mentor if you like. And that is the biggest strength of the movie. 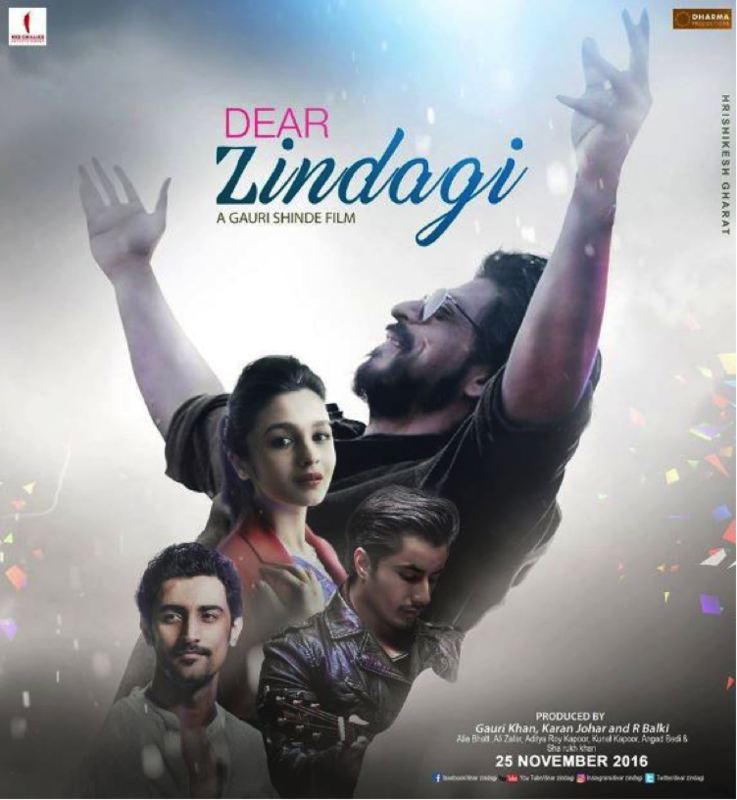 That today’s often dazed and confused youth needs a mentor to share their inner selves with and to ease themselves from the burden they find around is the fine fabric of Dear Zindagi which makes it easily a one-time watch, even a lovely charming movie that doesn’t shout for attention. That said, interestingly, if you step back and carefully observe the wildly smiling and hard partying younger generation then you will find that often the lack of guidance becomes a thorn in their flesh. It can hamper lives and slow progress and even fail many. We must have someone, other than a friend, like the extract from a book- ‘a philosopher and guide’- can go a long way in smoothening our journey and may just help us in realizing our potential. If we have an endeavor from which we feel we are faltering and are unable to go the long run, there should be someone to watch our back. And to push us to go the distance. Dear Zindagi is a fine tribute to an uncanny bond that exists or can exist between unlikely age groups, between souls that are chalk and cheese to one another. With soothing music and a tightly structured script that balances the energy and confusion of Alia’s jovial character to the steadiness of Shah Rukh’s mature ‘friend’, the movie manages to make you break picture perfect biases you’ve formed about youngsters. And manages to make you chuckle more than you think. Go for it. TrendMantra rates it 3.5 on 5.